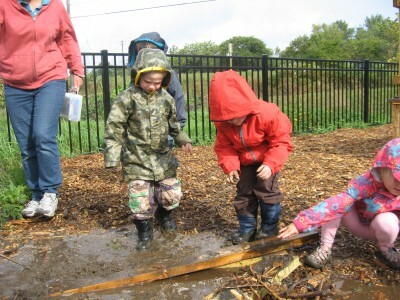 Noah’s Ark Christian Academy in Barrington, IL created their outdoor classroom so children would have a place to explore and learn about nature in a safe environment. A decision was made to keep their area simple, using the colors of nature as their palette. Flowering plants have been included throughout to add a vibrant splash of color to each of the areas in the classroom. Bright lengths of fabric are draped, twisted and folded into an endless number of fun, imaginative ways. 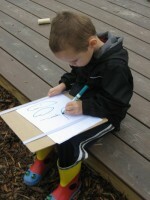 Planning of the classroom started with a Nature Explore design consultation. With a concept plan and educator narrative in hand, fundraising was started to cover the expenses of this new outdoor learning center for the children. Nature Explore flyers were sent out during development which resulted in a wonderful turnout of supporters who donated their time, talent and money to make this new endeavor a success. A silent auction fundraiser was also held which helped to fund this large project. A clear division between areas has been developed through use of tree cookie stepping stones, wooden paths, a wooden bridge, large logs and plantings. Tree cookie signs provide little ones with an understandable and appealing, clearly labeled name. 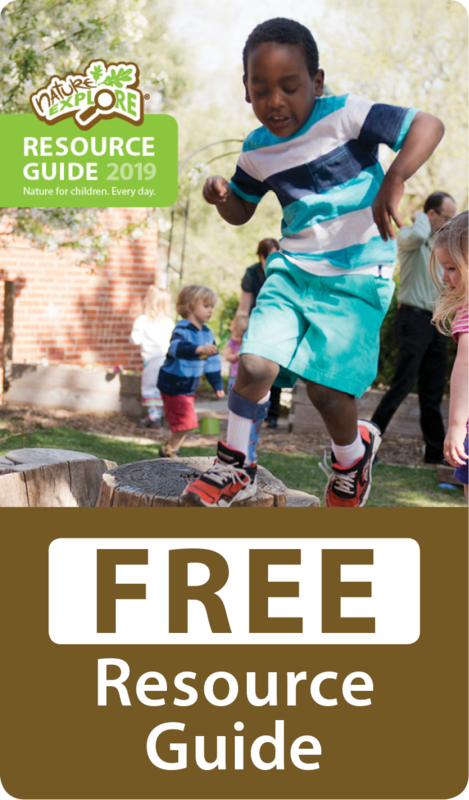 Children and families were asked to plant grass seeds in the Open Area of the Nature Explore Classroom, explaining to them that this area would develop into a place for the children to run, jump, roll, dance and engage in other large-motor activities. 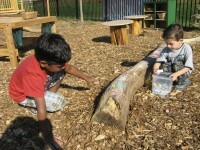 Children crafted large, square pavers to use as surfacing for the Nature Art Area floor. These were decorated with a variety of beads, charms, shells and other small pieces to make each a unique piece of artwork. Storage units were made by generous preschool parents. In addition to a marimba, a unique pebble harp was included in the Music Area. This instrument is a one-of-a-kind, outdoor musical play element that creates never-ending entertainment with beautiful, random, musical tones from pebbles cascading over tiny metal “strings.” Soothing, tinkling, musical sounds complement the music of the wind, birds, rain, and other, gentle sounds of nature. Children hear different sounds during each use, as the pebbles vary in size and find different paths to the bottom and back out onto the ground. 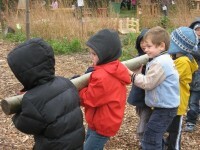 Children develop many skills as they learn, play and work together in the outdoor classroom. 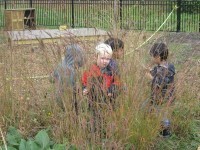 Classrooms send a nature discovery bag home with the Nature Explore student of the week.